RIT holds its annual Glass Pumpkin Patch fundraiser on Saturday, Oct. 9. Students and faculty from RIT’s School for American Crafts made all of the glass art. With the fall season underway, one-of-a-kind glass pumpkins and gourds created by Rochester Institute of Technology artists are ready for harvest. The popular fundraiser the Glass Pumpkin Patch will be held on the RIT campus from 11 a.m. to 4 p.m. Oct. 9 in the Red Barn, on the west side of campus, off of Minett Drive. 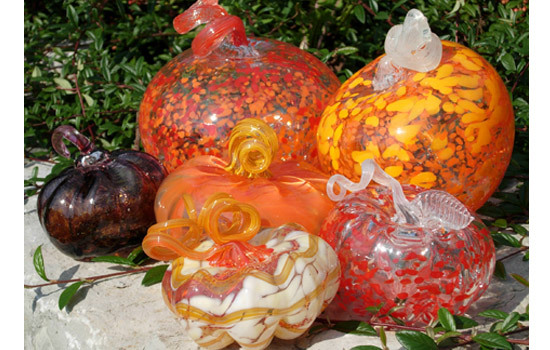 Students and faculty from RIT’s School for American Crafts Glass Program make hundreds of colorful pumpkins and gourds using traditional hand-blown glass techniques. The prices range from $25 to $400 (cash and checks accepted only). Proceeds from the sale benefit the Visiting Artist Series in RIT’s School for American Crafts glass program and the RIT Women’s Council scholarships. Organizers raised more than $20,000 last year.